Teachers typically use studio-based learning in the fields of architecture, design, engineering, and creative and performing arts. Although diverse in its forms, studio-based learning always focuses on learning through action and developing an assessable creative and/or design process, performance or product. Assessing creativity is controversial, not least because of the multiple ways people construe creativity, but also because of the highly personal way in which we experience and make judgements about it. Studio-based assessment is suitable when graduate outcomes include the ability to design and develop a creative product of any kind. The "studio" is normally a dedicated classroom, design or performance space, but may also be a constructed social environment in a virtual space, or a personal space. Studio-based learning can be highly engaging for students, enabling them to develop capabilities in a holistic and authentic way. It situates learning in quasi-professional activities that enable students to integrate, reflect on and apply their learning, and thereby learn more deeply (Gibbs, 1992). We now recognise collaboration as being important to creativity in a professional context, and see creativity as being enacted and valued as much in a particular disciplinary context as in an interdisciplinary one (Csikszentmihalyi, 1996). Studio-based assessment allows for learning to be enriched by collaboration and team-work. Studio-based learning also encourages dispositional attributes such as risk-taking and curiosity, and such generic skills as communication, problem-solving, team-work, project management and independent learning. Teachers can incorporate these related capabilities, along with the development of discipline-based knowledge and technical skills, within an integrated and holistic design for studio-based assessment. Teachers can sometimes find it a challenge, with studio-based assessment, to clarify what they mean by creativity, so that students can understand what they are expected to demonstrate, and staff can feel confident that their assessment will be valid and reliable. It can be hard to strike the optimum balance between assessing the processes and assessing the products of creativity, while also taking account of the personal dimension in creativity, and the influence of the setting. Another major challenge is for teachers to identify and articulate suitable criteria to assess students’ creative work. Some educators even argue that setting assessment criteria can work against creativity, as it discourages students from taking risks and from pursuing novel and idiosyncratic solutions. Staff are often concerned about how they will moderate the subjectivity inherent in assessing creativity. Style and aesthetics are very personal matters; marker variance can be as high as 75% (Pritchard & Albon, 2003). Where assessment tasks involve students completing a substantial project, teachers can find it challenging to identify appropriate stages at which to provide feedback to students without dampening their creativity and experimentation. The point of using studio-based learning is to mirror professional practice in creative fields. Ensure that task design and learning environment, as well as the mode of assessment, are as authentic as possible—that is, that they resemble as closely as possible actual tasks the graduate will encounter in their profession. In the early stages you can present students with simpler tasks and employ less onerous assessment standards. The context of learning reflects the conditions under which the assessable performance will occur. The assessment process is seamlessly integrated with the learning activity. Students are required to be effective performers with acquired knowledge and to craft polished performances or products. The learning and assessment activities require significant student time and effort in collaboration with others. The assessment tasks involve complex, ill-structured challenges that require judgement and a full array of skills. The assessment provides multiple indicators of learning. The assessment achieves validity and reliability with appropriate criteria for scoring varied products. With studio-based learning, you can assess multiple dimensions of creativity—the processes, the products, the learner’s part and the influence of the learning setting. Although definitions and emphases differ, educational theorists consistently agree that creativity represents the highest order of learning, encompassing and transcending lower levels such as understanding and evaluating (e.g. Anderson & Krathwohl, 2001). Person—acting and thinking like an artist or designer. (de la Harpe et al., 2009, 15). The later Assessing Creativity project, in the fields of architecture and design, introduced a fourth dimension, acknowledging the influence of “environmental factors—Press—that place restrictions upon the individual and create opportunities for creative agency” (AGOLT, 2012, 13). With Product, the emphasis is on the final product or artefact. With Process, the emphasis is on developing the product or outcome. With Person, the emphasis is on student development and growth, focusing on the emotional aspects of learning. Also see Aligning assessment with outcomes. When you choose assessment methods that will guide students towards achieving the learning outcomes, disciplinary priorities and emphases will drive your selections, as well as the particular objectives of each course. You will generally have to assess a wide range of learning outcomes, including creativity, and this requires a combination of assessment activities and tasks. The Assessing Creativity project found that tasks for assessing creativity in the fields of architecture and design typically fall into 6 main categories of outputs (what is being assessed): project proposals, models, drawings, presentations, portfolios and reflective journals. They also found that the methods for conducting assessment (how is it being assessed) fall into 6 types. The table below sets out these methods’ relationship to the main outputs. The sequence of the assessment types reflects the decreasing role of the student as an engaged participant in the assessment experience (AGOLT, 2012, 20). You can use technologies not only to support these assessment methods but also to enhance the flexibility of learning for students, to enable them to manage their own learning more effectively and to support their development and integration of graduate capabilities in preparation for their professional careers—e-Portfolio tools, wikis and blogs have proven particularly valuable for studio-based learning. As an integral part of the assessment design, you will specify assessment criteria, and from them derive assessment standards for each component of assessment. You may keep the standards for assessing performance in creative work quite generic, as the type of product can vary considerably. Assessment standards help everyone—students and the assessment team—understand what levels of performance are expected for each outcome (Webster, 2007). To help students understand how the standards apply to their particular situation, keep up an ongoing dialogue with them. Give them some practice applying the criteria and standards to the work of their peers, and to their own developing work; this will engage them deeply with the task criteria and develop their skills in self-assessment, peer review, and giving and receiving feedback, all of which are fundamental objects in their own right in studio-based learning. Experienced teachers can usually distinguish between average and exceptional student performance—we know “what can be counted as ordinary within a discipline and what is not” (Reid & Petocz, 2004, 54). Often our ability to assess students’ creative work within a discipline effectively improves over time (Crebert et al., 2011, 23). When experienced assessors develop a standardised criterion-based system of assessment, they can enlighten less experienced teachers, as well as students, as to the qualitative differences in levels of performance on assessment tasks. better accountability for the validity and reliability of assessment practices. negotiate criteria in the light of the piece of work itself rather than using predetermined criteria (Elton, 2005). You can amplify the advantages of designing assessment-as-learning particularly well in studio-based learning by engaging various players in the assessment processes. Students themselves can play a very significant part as agents in their own learning through self-assessment, and studio-based learning is an important way in which they can increase their capacity to reflect on and improve their own learning. Acting as peer assessors is equally important, not only for the intrinsic reciprocal value to students, but also for the multiple assessment perspectives it can bring to the grading process, particularly as a means of moderating subjectivity in judgement. Engage other people from industry, professional associations and community groups in the assessment process to enrich the quality of feedback to students and improve the reliability of grading. Where students are required to make oral presentations, ensure that 2 or more people undertake grading, for example as an assessment panel. Wherever possible, make a recording of the presentation; this allows assessors to review it, to check the appropriateness of the marks they have awarded. Keep the recordings until the deadline for review of grades and appeals has passed. See also Assessing Work-Integrated Learning. Provide regular and timely formative feedback, so that students can act on it to improve their performance. Developing clear criteria and standards will mean that you have a framework in place for giving feedback on progress. Against this framework, fellow students can also provide feedback through peer review, and students can regularly self-assess. Ask students to complete regular reflections on their own progress, including how they have responded to feedback. This ensures the value of formative feedback, and can help to minimise the number of summative (graded) assessments that are required. When planning the feedback loop, consider at what points you want to give students formative assessment feedback. Will this feedback emphasise particular dimensions? For example, formative feedback may focus on the process and person, while summative feedback only relates to the product. See also Giving Assessment Feedback. ALTC Studio Teaching Project (2009), and Assessment Resources. Bachlin, T. (2005). Assessing Students’ Creativity: Lessons from research. Higher Education Academy. Ball, P. (2010). Assessing Creativity in Design: Emerging Themes for Engineering. Engineering Subject Guide, UK Higher Education Academy. Crebert, G., Patrick, C.-J., Cragnolini, V., Smith, C., Worsfold, K. and Webb, F. (2011). Creativity and Innovation Toolkit. Elton, L. (June 2005). Designing Assessment for Creativity: an Imaginative Curriculum Guide. Imaginative Curriculum Network paper. Moore, I. and Williamson, S. (2008). Assessment of Learning Outcomes: Engineering Subject Centre Guide. Engineering Subject Centre, UK Higher Education Academy. Webster, H. (2007). The assessment of design project work—summative assessment, CEBE Briefing Guides, March. Anderson, L.W. and Krathwohl, D.R. (eds) (2001). A taxonomy for learning, teaching, and assessing: A revision of Bloom's Taxonomy of Educational Objectives. New York: Longman. Australian Government Office for Learning and Teaching (AGOLT). (2012). Assessing creativity: Strategies and tools to support teaching and learning in architecture and design. Final Report prepared by A. Williams and H. H. Askland. Australian Government Office for Learning and Teaching, Canberra, ACT. Cowdry, R. and de Graff, E. (2005). Assessing highly-creative ability. Assessment and Evaluation in Higher Education 30(5), 507–518. Csikszentmihalyi, Mihaly (1996). Creativity: Flow and the Psychology of Discovery and Invention. New York: Harper Perennial. Ellmers, G., Foley, M. and Bennett, S. (2008). Graphic Design Education: A Revised Assessment Approach to Encourage Deep Learning, Journal of University Teaching and Learning Practice 5(1), 78–87. Forsyth, G., Zehner, B. and McDermott, R. (eds) (2007). National Forum on Studio Teaching. Sydney: College of Fine Arts, University of New South Wales. de la Harpe, B. and Peterson, J. F. (2008). 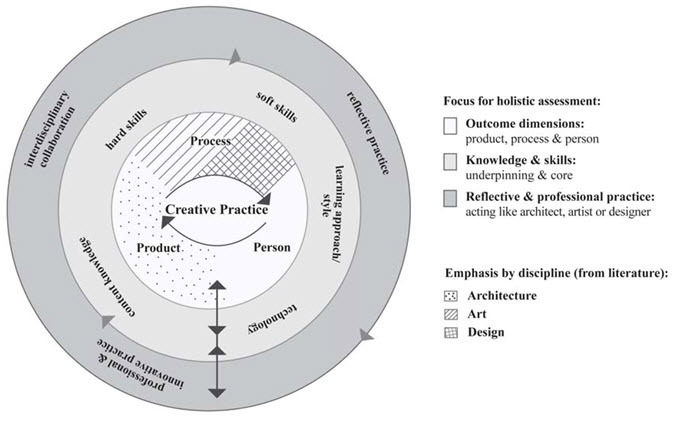 A model for holistic studio assessment in the creative disciplines. ATN Assessment 08: Engaging Students with Assessment. Herrington, J. and Herrington, A. (1998). Authentic assessment and multimedia: How university students respond to a model of authentic assessment. Higher Education Research and Development 17(3), 305–322. de la Harpe, B., Peterson, J. F., Frankham, N., Zehner, R., Neale, D., Musgrave, E. and McDermott, R. (2009). Assessment focus in studio: What is most prominent in architecture, art and design? International Journal of Art and Design Education 28(1), 37–51. Lebler, D. (2005). The master-less studio: An autonomous education community. Journal of Learning Design 1(3), 41–50. Pritchard, G. and Albon, R. (2003). Objective assessment in Product Design education: Addressing the issue of marker variance, Evaluations and Assessment Conference, Adelaide, SA, 24–25 November. Reid, A. and Petocz, P. (2004). Learning domains and the process of creativity. The Australian Educational Researcher 31(2), 45–62. Robinson, K. (2000). Out of our minds: Learning to be creative. Oxford: Capstone. Schadewitz, N. and Zamenopoulos, T. (2009). Towards an online design studio: a study of social networking in design distance learning. International Association of Societies of Design Research (IASDR) Conference, Seoul, South Korea, 18–22 October. Sternberg, R. J., Kaufman, J. C. and Pretz, J. E. (2002). The creativity conundrum: A propulsion model of kinds of creative contributions. New York: Psychology Press. de Villiers Morkel, J. (2010). "The passport, an integrated undergraduate studio-based architectural-design learning, teaching and assessment instrument." Unpublished paper presented at the 2nd ConnectEd Design Education Conference, UNSW, Sydney, NSW, 28 June–2 July 2010.